Q. When in your opinion is the light best for taking photographs in Paris? M: When the sun is shining, late afternoon to sunset. Paris often has an overcast white sky, poor for cityscapes. My favorite time is right at the moment all the city lights come on after sunset. The sky is still bright, the shadows on the buildings are not too dark and the lights make the city magical. Q. What is the best neighbourhood to photograph in Paris? M: I like the 5th arrondissment, the Latin Quarter. This neighbourhood best represents Paris in olden times. But every neighborhood has its own beauty. Q. What is your opinion on the love locks controversy? Q. Which bridge in your opinion gives the best view of Paris? M: Pont de Arts, with the historical island and Pont Neuf in one direction and the Louvre in the other with the Eiffel Tower in the background. For sunsets, Passerelle Debilly near the Eiffel Tower. The best views of Paris are from the bridges. Q. What’s your favourite story from your time photographing bridges for the book? 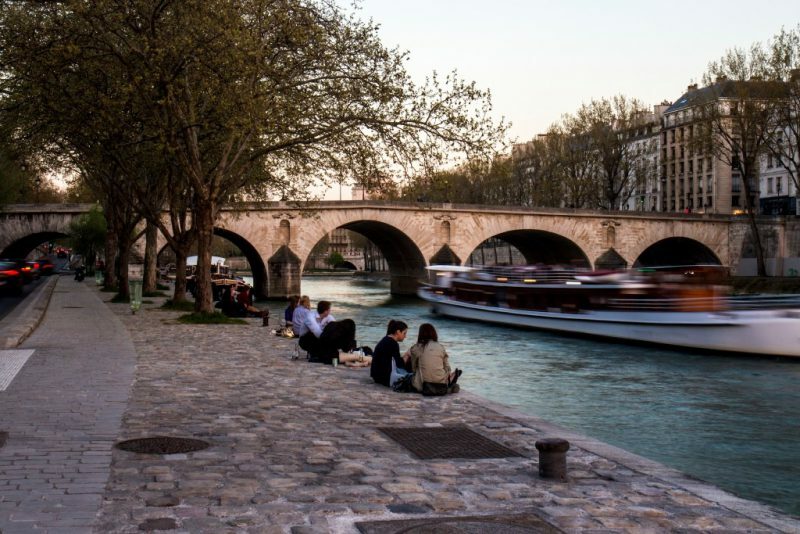 M: I had been standing on Pont Mirabeau for two hours when a well-dressed French woman stopped to chat. She grew up crossing this bridge. Did I know Guillaume Apollinaire immortalized it in a poem she had to memorize in school? Or that the poem is inscribed on a plaque? Then, much to my surprise, she walked me back across the bridge from where she had just come and proudly showed me the plaque. She shared stories from her youth the whole way. This bridge was not just a crossing but an intimate part of her life. Her enthusiastic love for Pont Mirabeau was a huge inspiration to me. Q. What type of camera would you recommend for someone starting out in photography? M: An inexpensive one. A quality camera does not automatically make quality images. A good image comes from the photographer’s ability to see the light and compose the image properly. A skilled photographer with a mobile phone camera will get better results than a tourist with a $5,000 Nikon. First learn how to take a quality photograph, then buy camera gear that meets your style of image-making. Q. What in your opinion is the most underrated place/attraction in Paris? M: Glad you asked — the bridges, of course. A bridge is typically viewed as just a way to get you from one place to another. But each of the bridges of Paris is a destination, beautifully designed, unique, historical. Q. How long did it take to put the book together from inception to publication? M: About three years. One year doing research and assessing the sales potential of a photography book about Paris, then three months in Paris shooting the first images. I showed these around and got very positive feedback, including interest from a couple publishers and possible investors. So I spent a full year on the bridges in all seasons, waiting for the perfect light. Designing the book took six months and then I went back to Paris for three more months to get the final photographs. Q. What’s next for you – any upcoming projects? M: In the Footsteps of Vincent van Gogh. I have been studying the post-impressionist artist for many years and have visited all the places he lived and painted. Vincent was a bit crazy but nowadays he is the most well-known artist in the world. Why is that? Great interview! I loved the bridges when I was in Paris. I really must get back soon!